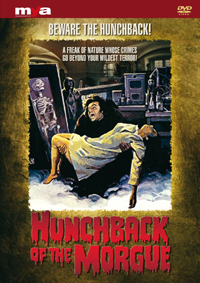 Gotho (Paul Naschy), a moronic hunchback employed in a hospital morgue, is deeply in love with Ilse (María Elena Arpón), but it’s an ill-fated relationship. Ilsa is terminally ill with tuberculosis and dies shortly after. Out of his mind for the loss, Gotho steals her corpse, killing the medical students who are going to dissect it, and hides her in an underground crypt. Dr. Orla (Alberto Dalbés), a mad biologist, promises Gotho that he will revive Ilsa, but Gotho will have to provide him with dead - and live - bodies for his terrible experiments.